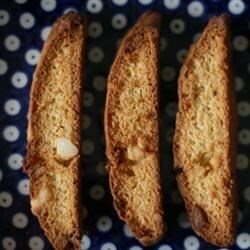 "A softer biscotti and a wonderful addition to your cookie platter." Preheat oven to 325 degrees F (165 degrees C). Grease a cookie sheet or line with parchment paper. In a large bowl, cream together butter and sugar until fluffy. Beat in eggs, vanilla and amaretto. In a separate bowl mix flour, baking powder and salt. Stir flour mixture into butter mixture. Fold in nuts and white chocolate chips. Divide dough into 4 equal parts. Place each 1/4 of dough on cookie sheet and form into logs about 14 inches long and 1 1/2 inches wide. Bake 25 minutes in the preheated oven, until very lightly brown. Cool and cut diagonally into 1/2 inch slices. Arrange slices on baking sheet and continue baking 8 minutes, until golden brown. Great recipe!! To make them not so soft, after I cut up the logs into pieces, I baked them a little while longer on each side. They turned out perfect. These biscotti are so delicious. The dough was sticky. I refrigerated the dough overnight and it was easier to work with.